Today, in GUUUUUOOHMYGODWHY, a Colorado woman attempting to send a voice text message while driving collided with a guardrail, which somehow found its way through her seat, into her upper thigh and buttocks, impaling her. Ahem, all together now: NO. A pole from the guardrail reportedly pierced straight through the body of the car and into Jahnz's upper thighs and buttocks, leaving her helplessly impaled. "The next thing I knew, I was looking up, and there was white powder from the air bags deployed," she told Channel 9 News. The paramedics had to saw through the guardrail so that she could be taken to the hospital with the pole still in her body. "I went into surgery and I lost count of the stitches after 40. They stitched me up inside too. I'm truly a miracle. They said if it [had] gone just a little bit the other way I would have bled out," said Jahnz. 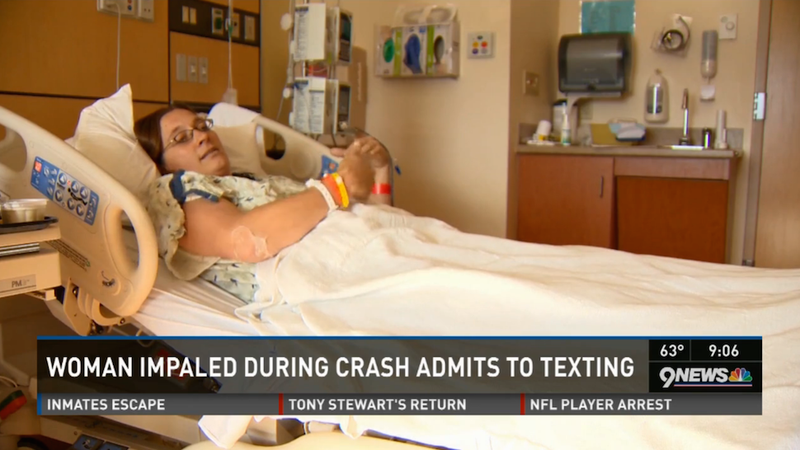 Jahnz said that she hopes her story will serve as a warning to others not to text and drive. "It's devastating knowing that I could have prevented it to begin with. I just hope my story helps to save the lives of others. Don't text and drive," she said. Okay, so it's definitely something of a miracle, but I wouldn't exactly be testing fate by saying, "I'm a miracle." But whatever—that lady's been through enough. Or I guess... enough has been through...nevermind. Anyway, be safe out there this Labor Day evening.